Mental health. A concept that needs a lot of attention, love and awareness for one’s self. Something that is crucial to your life, if you want to live it happy, healthy and free. A phone. A device that is useful, but has many disadvantages to your health, mentally and physically. It increases anxiety, decreases your confidence and makes sure you spend as little time as possible in the present, as well. Mental health + a phone, in one box? Not that good of an idea. But as it is both crucial in our daily lives, there must be advantages, right? And you’re right! There are three apps, that you will discover in a couple of moments, which help your mental health while being downloaded to your phone. Curious already? Well hold on a minute because you will get a small surprise: after you have discovered the three apps, you will get 6 (free) tips on how to decrease your time spent on you phone. You’re welcome! An app that contains almost everything. You can track your health (do you drink enough water, sleep enough?, etc. ), meditate and talk to other people about many things, from school or anxiety to family issues. You can also set reminders to remind you to walk outside or to meditate, for example, and create a ‘hope’-board, for if you’re down. I have been using Pacifica for over a year and I can honestly say that it has improved my mental health extremely, as I have become more aware of how I have been, and currently am, living my daily life, plus it has inspired me to become a better person, every day. Download Pacifica and you can start right away. There are packages for which you have to pay, which are amazing but the free ‘package’ is good as well. Pacifica is available on iOS & Android. 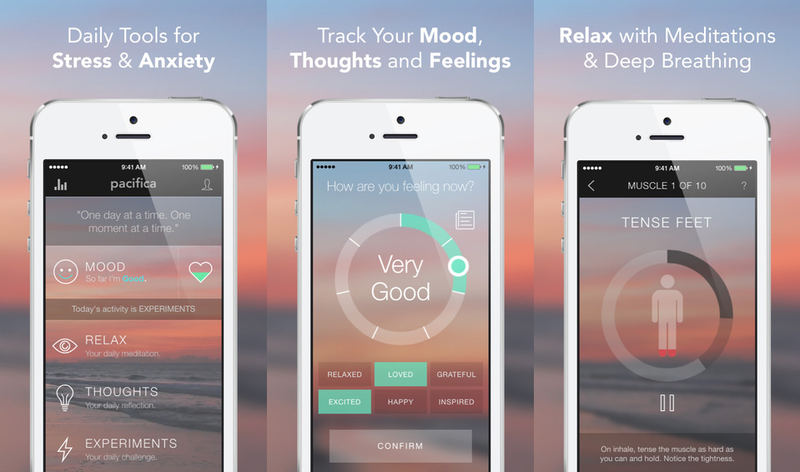 An app full with meditation. An app full with dedication. To your mind, breath and mental health. If meditating is unknown to you, I highly recommend you download the app Headspace and just start. Meditation has been proven to improve your health in general, massively, and around 60% of all the successful people you know do it (i.e. Micheal Jordan & Oprah Winfrey, to name two). Meditating will change your life, trust me. I have noticed my mind is much calmer and I have learned so much about focus, clearing thoughts, letting thoughts pass and much more. I could honestly continue for quite some time, but this article would become way too long. In Headspace, you can first start off with a basic package, where you learn how to meditate roughly. Then you can move on and choose your first different meditation, which will focus on different aspects in life, from self love to commitment. You will first of all learn a lot, but it is mainly an app that will improve your mental health in just a matter of weeks! Headspace is free when you meditate with the basic packages and you have a couple more meditations which are free, but you will have to pay once you want to unlock more meditations. But trust me, if you can, do it because it is worth it. But it is obviously okay if you don’t. Headspace is available on iOS and Android. Crucial. Apps that show you how much time you spend on your phone daily and on which apps, can help you grow and improve your mental health. As you have already read, mental health and a phone are not the best combination, but reducing the amount of minutes on your phone can help you tons. Once you have addressed the problem, aka the apps you spend most of your time on, you can take that as a lesson and start to pay more attention to how you are using your phone in the future. For example, I know I tend to spend a lot of time watching useless videos on YouTube. Now that I know how much time I waste with doing that, I can pay attention to it and for example set a timer the next time. This way I can still watch my favorite videos, but in a space that sets a boundary for me, so I won’t continue to watch other videos. Apps that I have used & are worth the download: Moment on iOS and App Usage on Android. Set a reminder after … time. If you notice you tend to ‘bingescroll’ your phone or you often watch too many episodes on Netflix, set a timer for, let’s say, 20 minutes and in those 20 minutes you are allowed to answer texts, watch videos or scroll. But once the timer goes off: you put your phone away & get to work! Leave your phone at home, when you leave. When you set off to the grocery store or to work, consider leaving your phone at home. You perhaps need it to where you are going, but if you really don’t, don’t bring it! Enjoy the situation around you & connect to the world. Leave your phone in another room when you are sleeping. Phones can distract you when you are sleeping. If you hear a buzz, you probably immediately think: ‘oh no, I am missing important news’. Well guess what, 9/10 times, it is not important. Sounds harsh, but the ‘news’ can wait 9 more hour, until you wake up. Learn to appreciate things outside of your device. Plenty of times when you’ve used your phone, you did it to block out ‘awkward moments’ or because you felt like you had to do something with your hands. Instead of grabbing your phone, take a deep breath the next time. Look around and appreciate what’s around you. It is a good characteristic to have to be present. We tend to ignore the situation and find a way out but you will see, often what happens around you is wonderful or at least, you are confronted and you can grow from that! Get a new hobby which you can fill time with. If you notice you look at a screen too much because you have time left, find a new hobby where you can put time in. This way you will have to focus on other things instead of on your phone. Do a ‘phone-challenge’. Be creative & set goals for yourself. You can also do this challenge with friends (more fun guaranteed!). To give you an idea: spend less than 2 hours on my phone every day. Or: no longer than 10 minutes screen time, every time you open your phone. Get creative, challenge yourself and grow! Do you have more helpful tips? Let us know! Have you found an app you want to download? Or have you already downloaded one an app I mentioned and if so, what are your thoughts about the app? Let me know in the comments or contact me for further questions or suggestions! Hopefully you’ve learned something & don’t forget to put down your phone once a while! Ah that doesn’t sound good:(… You can always contact me or read other articles on my site to maybe get some help and feel less bad if you ever feel that way. And know that it is not your fault, it is the man who has issues. You are not alone & I love you!